Does your teen have Bieber fever? Chances are you’ll be attending a concert with her soon. Discover tips and tricks to stay safe with your teen at her first live music experience. Big concerts are a crucial part of growing up. But how do you let go and expose your teen to all the wild fun and loud music? Try these tips for introducing your kid to live music and the craziness that comes with a rock show. Until your child reaches late teens, it’s best to act as a chaperone at concerts and rock shows. Whether it’s a huge arena show or a small venue, crowds can get out of hand quickly. Alcohol and excited adults aren’t always the best recipe for interactions with teens, especially teens who look closer to college-aged. In the best possible situation, your teen will appreciate your company and you’ll love the music you’re listening to. In the worst situation, you’ll be stuck reading Twitter on your phone while your teen pretends like you’re not there. Either way your teen’s safety is the most important goal. A big concert can be a huge wake-up call to teens and tweens that don’t spend much time around inebriated adults. Something about live music brings out the worst in grownups. Even if you’re seeing a teen idol, be prepared to deal with adults who have had too much to drink. Discuss the ways adults may act before you get to the concert, where it may be too loud and exciting for serious conversations. Let your teen know that certain behaviors are unacceptable whether they involve adults or not and that you don’t condone things you may witness at the show. Don’t allow your teen to head to the bathroom or concession areas alone. Stick with a buddy system to ensure that your teen is safe in the venue. 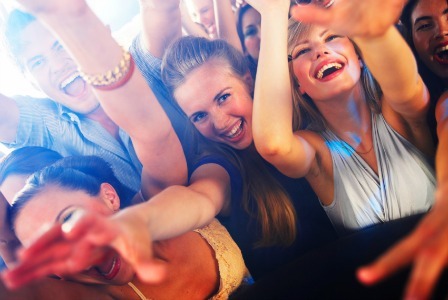 Keep an eye on concert-goers around you and be aware of excessive alcohol use or drug use. If you’re at a general admission show, avoid standing too close to areas that become rowdy. Consider using protective earplugs if you’re sitting anywhere near the stage. Hearing deterioration starts at a young age and you’re better off playing it safe when it comes to loud music. Tweens and teens have big, bold emotions. Combine those emotions with the energy of a live concert and a huge celebrity crush and you have a recipe for a seriously wound-up kid. Plan ahead for dealing with a teen who is totally amped up on excitement. Try having dinner at a late night diner or renting a movie afterwards to help your teen settle down. There’s no way she’ll be going to sleep at a reasonable hour and that’s OK. Big concerts are a special, infrequent treat and it’s all right to indulge in some routine-breaking and high-pitched squealing.